Today we’d like to do something different: we’d like to give you a few reasons why we think you should come to Bologna. Now, we might be a little bias about this, but we believe it would really be worth it for you, whether you’re passing through, or have a cheap flight connection, to come over and visit our beautiful town for a few days. We all love Rome, Venice and Florence (sure, we’ll throw in Naples too). But the truth is, you get a lot of tourist baits in places like that, and it can be hard to have an authentic Italian experience. Though it has seen a boom in tourists in the past few years, Bologna is still very much a place of locals. Sure, you might hear a few foreign languages strolling down our porticoes, but just turn the corner and you’ll see a couple “umarels” (elderlies) arguing in dialect as they talk about the local football team or play cards. 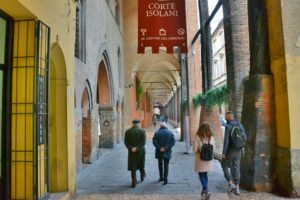 Bologna has a very strong identity you can feel in the air and see, both in our landmarks and in the faces of local people who have fallen in love with it through the years. Alma Mater Studiorum goes all the way back to 1088. When I was studying there I liked to joke and say facilities haven’t changed since, but really it’s quite amazing what they did with it. It doesn’t have a campus, because the city itself serves as one: there is an entire portion of the center dedicated to it, resulting in a unique blend of youth and diversity. It’s also the number one choice for students coming on their year abroad, which helps making Bologna one of the most vibrant and active cities in Italy. Festivals, exhibitions, conventions… You’ll find there’s always something going on! No kidding. Forbes crowned Emilia-Romagna as the best in the world when it comes to food. You might not have an Italian nonna (grandmother) cooking you tortellini, lasagne or tortelloni… but that’s when we come in! Just join one of our food tours and we’ll make sure you get the best and most authentic experience possible! PS: Don’t worry, we’ve also got some of the best wines in the world. orghini, Maserati, Ferrari. They’re all based a few kilometers from Bologna, respectively in Sant’Agata Bolognese and Modena. Not a big fan of cars? Prefer motorbikes? Fair enough! If Ducati rings a bell, you’ll be happy to hear that’s from Bologna too! Listen. I’d like to tell you Federico Fellini was from Rimini which is just about 80 kilometers from Bologna, but people from there would be really upset if we tried to take credit for their director. Still, we’re really really close! If that’s not enough, Bologna’s got an amazing cineteca (film archive and laboratory) that constantly works on re-mastering masterpieces. Every summer we have an open cinema in Piazza Maggiore, at night, where you can come and see re-mastered movies in an amazingly vibrant environment. They even have a live orchestra to go with silent movies. It’s insane. 6 – What more do you want? Music? Bologna’s been named Creative City for the Music by UNESCO in 2006. Canals? We’ve got them. They’re hidden, but doesn’t that make them even more romantic? Theatre? Porticoes? Outside-Markets? Towers? Churches? Parks? Tourists in Bologna love to wander. They like to roam around and find small alleyways they didn’t know about: there’s always a church, a bar or a garden if you allow yourself to get lost. It’s something special you can’t do anywhere, but our center is cozy enough for you to just walk around without having to worry about where you’re going. Again, we’re bias on this one, I’ll admit it, but there’s something about our city… Every time I come here I feel like things are fine, somehow. There’s an energy to it. Maybe it’s the university; maybe it’s the fact I don’t get soaked even if it’s raining… I don’t know. Lastly, if you still don’t feel like coming all the way just to visit Bologna: that’s fine. We’re so conveniently located it’ll probably be in your path anyway: whether you’re going from Venice to Florence, or Milan to Rome, you will pass through Bologna. So, maybe, just take one day off your schedule: give it a chance, spend a night. I never heard of anyone regretting it and I promise neither will you.